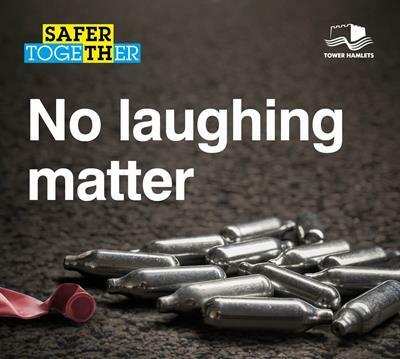 No Laughing Matter is the name of a campaign by Tower Hamlets Council, Tower Hamlets Police and Tower Hamlets Homes to help tackle some of the problems caused by nitrous oxide. It follows complaints from residents that antisocial behaviour linked to the taking of nitrous oxide, otherwise known as laughing gas, has become a significant concern within the borough. Groups of people taking it cause noise nuisance and it also causes a litter problem because small metal canisters containing it are often left discarded. The police have also received reports of people taking it while behind the wheel of a car. Indeed the Love Wapping website has documented several car crashes where the use of nitrous oxide has been implicated. The issues and actions are detailed in this leaflet. If you see canisters are in streets or parks please use the Fix My Street app/website as this will help FOMEP see hotspots and nudge the powers that be to target these. Alternatively, you can report them to the council’s street cleaning team on 020 7364 5004. Very nice step taken by FOMEP. People think nitrous oxide is just a laughing gas regardless of the fact that its actually a chemical which causes different kind of pollutions. Thank you for your kind information on Crash Repair Dublin. I really needed to know where to to go for repairing my car due to an accident. Thank you again.